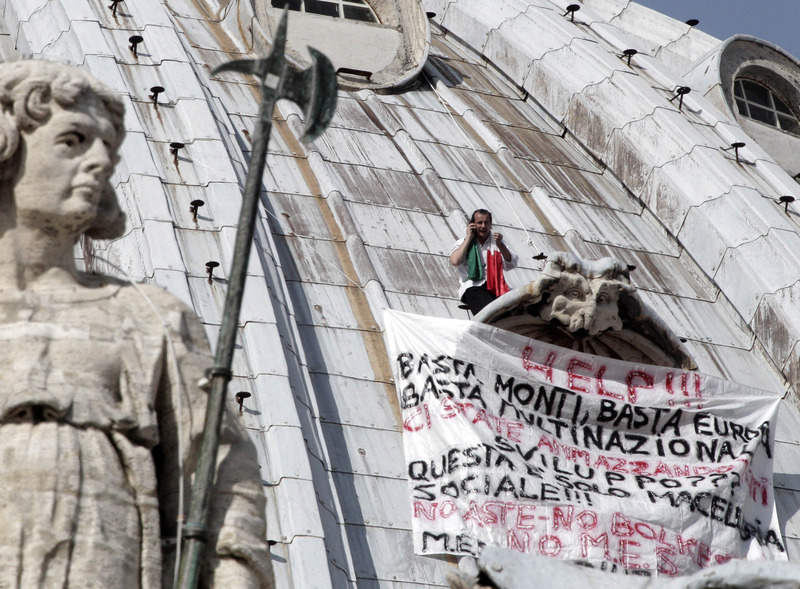 VATICAN CITY An Italian man gave up his protest atop the St. Peter's Basilica on Wednesday evening, after more than 24 hours perched on the 426-foot-high dome to demonstrate against government reforms. Two firefighters helped pull Marcello De Finizio inside the basilica a full day after he had eluded Vatican security to scale the dome and unfurl a banner reading: "Help! Enough Monti!"  referring to President Mario Monti, the architect of Italy's economic reforms. De Finizio was taken directly to the Rome police station, but told The Associated Press by cellphone that it was a `'formality" and he did not expect to face any charges. It was the second time in three months that De Finizio had scaled the dome. His previous protest at St. Peter's in July lasted only four hours, he said, and nothing came of it. He also spent three nights on a 70-meter-tall (230-foot) metal structure in Trieste earlier this year, and said a judge cleared him of charges of causing an alarm. De Finizio said he did not suffer any particular discomfort during the latest protest, which he ended after Tourism Minister Piero Gnudi agreed to meet with a delegation of beach concession owners to discuss new rules governing the sector. At issue are government reforms that will force an open bidding process for existing establishments and limit the length of the licenses. The government passed the measures in accord with EU norms to try to make the sector more competitive by preventing licenses from being passed from generation to generation. But the concession owners say they make considerable investments in the properties, including mortgages, that they stand to lose  and that they are unable to get loans for new investments while the changes are pending. `'The entire sector is on standby. This is a trauma for the sector, this is a trauma for Italy," De Finizio said. The concessions cover more than 4,000 kilometers (2,500 miles) of Italy's coast  or more than half of it  renting out lounge chairs, umbrellas and changing rooms and offering a coffee bar or restaurant. De Finizio lost his beachside restaurant in the northern city of Trieste in a 2008 fire and said he has been unable to get a loan to rebuild because of the changing norms.